I was looking for a good pet and after some searching on the hunter/pet sites, I stumbled across this guy. He is instantly mean and puts out an amazing amount of power. He's tough and the fire breathing really knocks down an enemy in no time. And apparently, he's a quick spawn, so finding him shouldn't be a problem. I found him a little north of the indicators on the map above. Dropped a freeze trap and took him in on the first try. Stock up on cheese! This NPC has multiple pop respawn. Found at 45 / 75 this time. It's not really rare. First of, everytime i goes there he's there. Unless I kill him. Second, Washte Pawne are just Like Owatanka and Lakota'mani. All three drops a "This items starts a quest" item. The quest you get from all three are returned to Jorn Skyseer in Camp Taurajo. 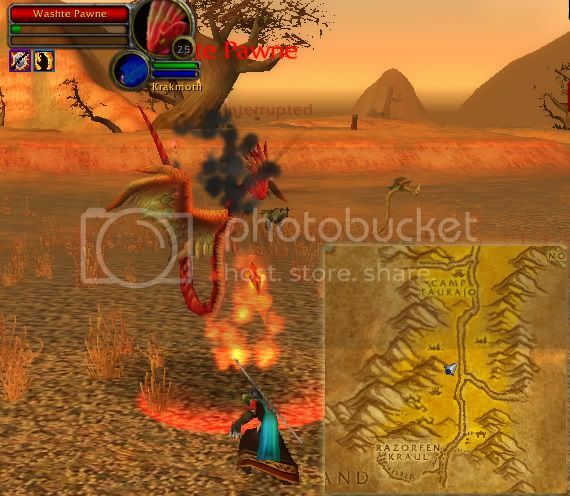 As far as I know, Washte Pawne is one of only 3 rare or elite wind serpents in the whole game, the others being in Barrens and Swamp of Sorrows. Any more out there? Could someone please give me the coordinates of Washte Pawne? I have been looking for him for a couple of days and have yet to see him. How long spawn time ? And MAN does he own. The directions south of Camp T near the Dustwallow marsh path is correct. He was 25 and I tamed with the help of a fellow hunter. Two freeze traps in a row, tamed him without a single hit. Just his lightning+dps is enough to hold aggro with me having a 11.8dps bow at 25. I love this guy. He murders in WSG, and in duels against people who spam duels on other people because they think they will win everytime. If you're looking for him, he's almost always around Blackthorn Ridge (the quilboar pig-men place in Southern Barrens), or on the other side of the path surrounded by a whole bunch of other aggressive beasts near the dwarf dig site. He knew Lighting Bolt V3 when I tamed him, and I don't plan on taming another serpent for a while. I was down in this area shown on the map for Washte's location just grinding out some xp. I didn't even know he existed till I saw him. I had a normal wind serpent trained as a pet and already loved thier dps. When I saw him I knew I had to get him. At the time I saw him though I was only 24 so could not tame him. Once I hit 25 i went back to the area to camp him out. I cleared as much of the Stormhides, and Hyenas out of the way so I would have room to tame him once he spawned. After about an hour or so I finaly saw him. And started taming him. Halfway through I was attacked by a Stormhide but it didn't break my charm. After the 20 seconds of taming him I had him and he opened a can-o-whoop a.. on the lizard. It was awsome. In comparison, a normal wind serent has an average armor of 835 at level 25. Washte at level 25 has an armor of 1057. All his other stats are better too. Untill I get higher and get a better named as a pet he gonna be following me for awhile. Got him yesterday. Looks extremely cool, and is working out great for me. I got him too, and i love him, he's really strong, and a nice asset, growl would defentally help hold aggro well, and i am waiting until i can get the chance to get a pet with dive, so i can teach it to him and have him increase his pursit speed, which will be useful in case whatever i'm against decides to run for it. I was lookin for him around Camp T and decided to give up and ghost wolfed (im a shaman) to go South to do the Bael Dun quest. On my way there I was killin the same model as Washte Pawn cept the yellow ones and I turned my camera angle and bam there he was. I killed him immediatly for the feather he drops to start the quest, lol. Found at 48,80. Good luck though he moves around alot. My current pet, and is working out very nicely, always attracts lots of comment too everywhere I go. Fights great, picks up and holds aggro better than my raptor and suits my style just fine. Has better armor than my basic Thunderhawk Hatchling at similar level, though the figure I saw immediately on taming was 1037, not 1057 as stated below. This compares to mid 800's for the yellow 'hawk. Easy to find and re-spawns quickly. I know this because someone killed her under my nose first time I found her (I was just seeconds too late) but when I returned a couple of hours later she was in a similar spot, to the west of the road, just south of the T junction with the eastgoing road on the map marked above. Tamed her easily with freeze trap and scorpid sting. I'll probably go after Arikara at 28 as she keeps the 'puff of smoke' on summon too, I love wind serpents as a pet. To tame him do u have to be 25 or 26? Only once in a blue moon do I ever see a fellow hunter with a wind serpent as his or her faithful companion. I saw Washte Pawne as my rogue and knew that I had to get him once my hunter hit level twenty-five. I had no trouble getting him, and he has worked out wonderfully for me and he will be by my side for a while to come. As Azunai stated, Washte Pawne's stats are better than that of other wind serpents', even better than Azzere the Skyblade's stats as well. I have her too, and I've compared them. I had WP as a pet and he worked out quite well. Traded him for Arikara at 28 though. Same stats but Ari kept the spawn smoke ability :) Nice little puff of smoke when i call him. And yes i had Azzere too. Stats were terrible but his red wing look was unique. White serpents have low stats also. Green and black do well though. I found Washte Pawne around 44,73 and was being attacked by 2 stormhides and him while taming, and as soon as I was through taming, he wiped out the stormhides. I think I found my new favorite pet. I was in the middle of the tame for him. However some level 26 warrior came by and attacked and killed him. Of course i was angry but i got him 15 minutes later. Edit: I can probably get a better pic of this guy, how could I submit it?